While I was at conference, I checked up on the CaringBridge site for sweet little boy that I’ve been praying for. Little sweet, adorable David Hood. 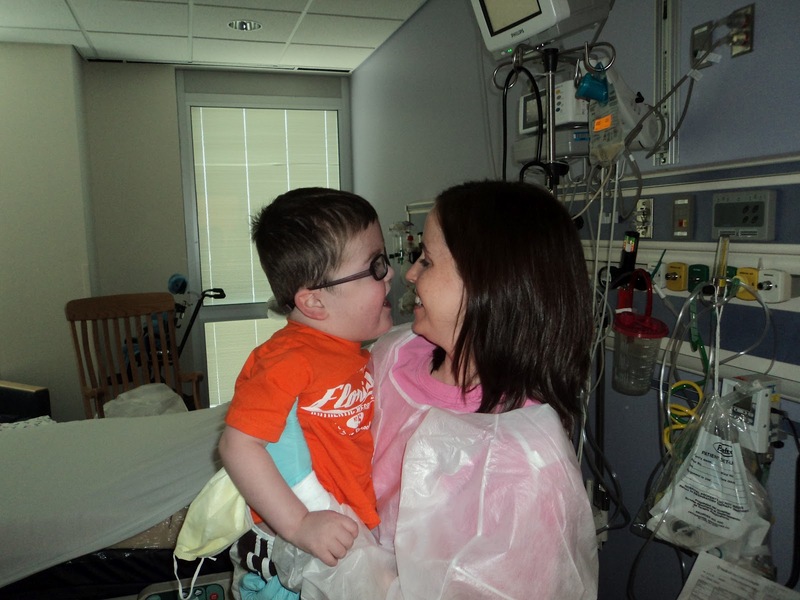 David LOVED giving his Momma’s kisses! His momma says he likes to show off his ability to give kisses when guests are there. I didn’t mind! SO INCREDIBLY SWEET!!! And I saw some very discouraging news. They’d transferred him to a bigger hospital last week to explore heart transplant as an option, as they were out of other surgical options. But shortly after the transfer, they found that transplant was not an option due to antibodies in his blood that made him ineligible. Which left them looking at palliative care, which basically changes the mindset of how you care for a person. Instead of looking at life extending, they look at ensuring quality of life and comfort. My heart broke for David and his mom, Jennifer, and her husband and daughter. Handsome David and his wonderful Mommy! I went to breakfast and worship at conference Saturday morning, but honestly, my heart was just breaking for them and I barely held back tears. Then, during worship, I realized something super cool. David is at Children’s in Dallas. So I left in the middle of worship, hightailed it back to my hotel room, and sent Jennifer a message to see if I could find a way to come see them. I’d scheduled my flight out the next day late, so I had the whole Sunday afternoon to do what I pleased. So, I rented a car for 2 hours (they charged 80 bucks for a cab there and back, no thanks!) and drove to see them! LOVED LOVED talking to my sweet heart Momma friend, Jennifer! and LOVED seeing David. He is such a fighter and it brings tears to my eyes just thinking about him. He was giving his momma kisses and giving such HUGE smiles when she walked in the door. My heart melted just looking at him. Well, the reason for my post today is to ask you to please extend your prayers for David and his family. He’s taken a turn for the worse in the last day, and where as they’d hoped to have a few more years with him, now it is looking more like months… if not weeks. They have transferred him back to ICU and upped some meds, but things are just super questionable at the moment. Seriously, those are the words of a woman who is serving Jesus and knows the value of every moment God gifts us with. None of us are promised tomorrow. And while having a goodbye be so immenent is so incredibly difficult, especially when it’s your child, to be able to treasure and embrace each moment is a true gift and testimony to how BIG a God we serve and how absolutely amazing it is to serve him and to trust Him. May we ALL learn to really live every single day God gives us, and not just trudge through it. Lifting my glass of Dr. Pepper to you all for a toast. Here’s to a non-trudging life! Such a sad story, Krista. But what a gift you must have been to that mommy! And you're right, what she wrote about not trudging through life is beautiful! Praying! Keep us updated. so sad. I follow their updates and will continue to pray!! My heart aches for all of them. Praying…and inspired to live a trudge-free life. Praying for little David, Krista. Really amazing that you were in the right place at the right time to give some encouragement. What an inspirational blog today 🙂 Thank you! I'm so sad for this family and little David. Prayers are up! I love your warm, caring, loving heart, Krista. What a blessing it must have been to Jennifer to have you drop by for a visit, pray with her, and offer her support. May the Lord be with this family as they embrace each day they have with this precious little boy. David's story is encouraging and sad. It's encouraging to know God is ready to care for this child and this child's family. God walks with them, holds them, and gives them strength to go forward each day. It's sad that David will probably only have a short time in this world. It's sad that David and his family have to walk in this valley. Mountain tops are wonderful, but in the valley we grow. It's sad that David must live through the illness. It's encouraging that David has a family to love him through each day. Tears. Oh my, the tears. I'm glad you got to visit them, Krista, so you can spread the word and lengthen the prayer chain. I will be praying for David and his family. 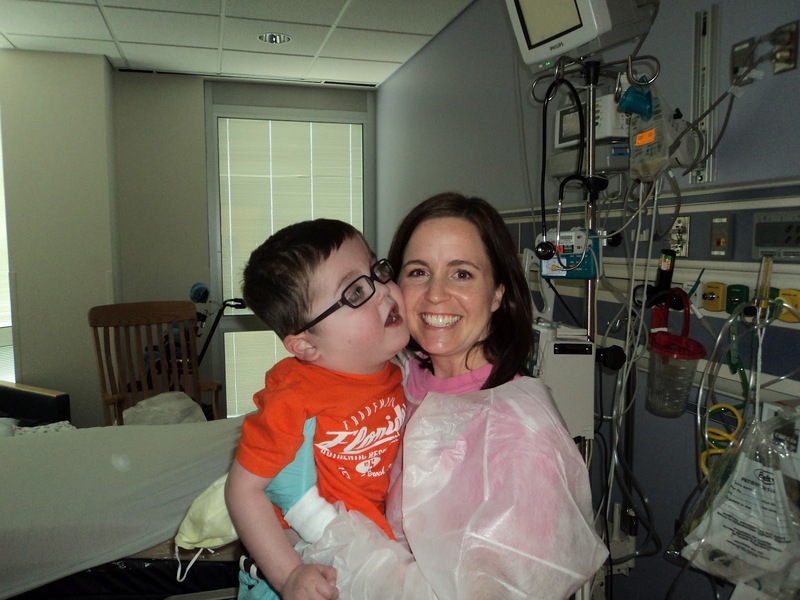 Thanks for having such a tender heart to share with us about this special, little boy. Isn't it wonderful how God works? First, He brings David to mind. He already has you in the right place and knew you would have enough time since you had previously scheduled your flight for later in the day. Thanks for being so sensitive to His leading you. I know it had to be hard to go but you did. I can't even imagine what David's mom – Jennifer – and the rest of the family must be feeling. We will definitely pray and ask our church family to pray, too. Thank you for reminding me to live a "non-trudging" life! May the Lord bless you! I love that reminder. NO matter how hard life might get, we have a God who promises to hold our hand the entire time. Here's to "non-trudging" too!